Celebrating our Recent Adoptions! All of our dogs have their own pages on our website FOREVER, soon you'll be able to see all of the dogs we've ever adopted. Be sure to check out our Facebook page for owner updates on our adopted dogs. If you'd like to share your Happy Tails success story, send us updates and pictures and we'll post it up to Facebook to share with the world. . Some of our dogs are still in their Foster-to-Adopt homes while making sure it's a good fit for both dogs and people, they are still Adoption Pending. Our Adopted Dogs of 2018! Banks is a 4-5 year old black male with silver feet. 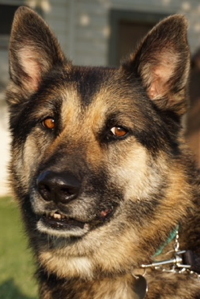 He was abandoned at a training/boarding facility several years ago. The facility is now closing, and asked us to find him a home. Banks is a mellow boy that is easy to have around the house. He gets along with other dogs and also with cats. He walks fairly well on leash and will sit for his meals. 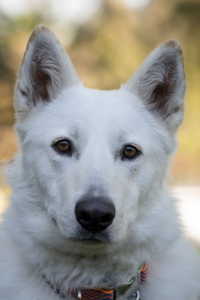 Ghost is a beautiful white shepherd, approximately 2 years old. He is a sweet, happy boy. He knows basic commands, walks well on a leash, likes to ride in the car and has good house manners. He is currently living with 2 large males and a bossy female (he is very smitten with her), and 2 cats, he gets along and plays with all of them. He likes to chase the cats, but he is very gentle with them and will immediately leave them alone when corrected. Ghost came to us as an owner surrender because he liked to take himself on walks thru the neighborhood. Tuvok is a 19 month old, bi-color, 75 pound boy. He came from a local shelter, so nothing is known of his background. Tuvok is housebroken and knows some basic command and he walks nicely on a leash. He is good in the car and waits patiently for you while you are in the store for 10 or 15 minutes. He currently sleeps quietly in his foster's bedroom at night, not needing a crate. Veronica aka Verona is a sweet and happy fawn colored female with a black face weighing about 45 lbs at 6 months old. 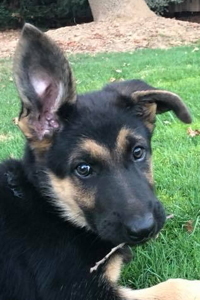 One ear isn't completely up, it has a bend at the tip. She was a stray from a shelter, so nothing is known of her background. 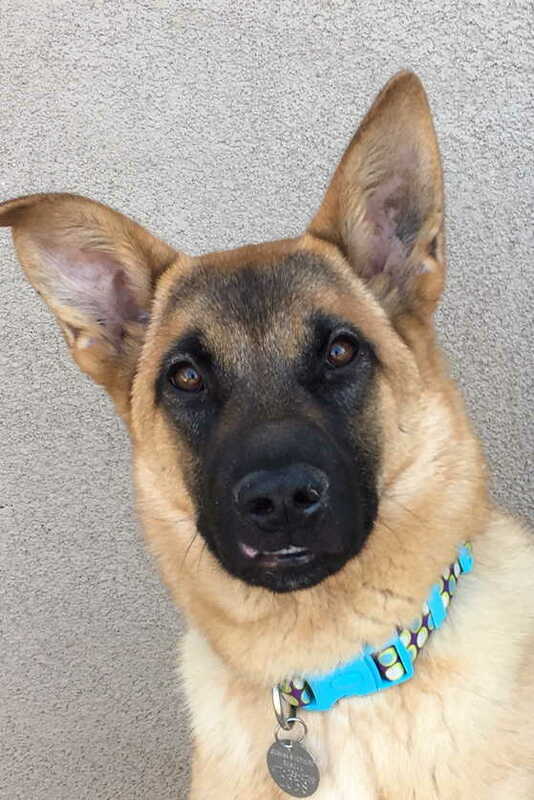 We believe she has a touch of Belgian Malinois, which explains her coloring, affectionate nature and fun energy. She can stretch with her back legs completely behind her like she's practicing yoga. 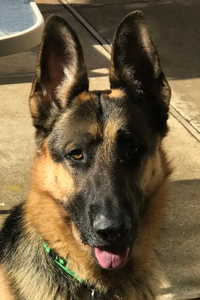 Verona is in a foster home with three German Shepherds and a cat. The youngest male tries to play with her, but he has a rough style, so Verona rolls over to submit when he gets a little rough. 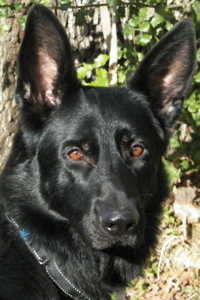 Gregor is a handsome 2.5 year old all black male. At about 80 lbs, he is on the thin side and could stand to put on a few pounds. He was surrendered by his previous owners when the husband became sick and they were unable to care for or exercise Gregor properly. 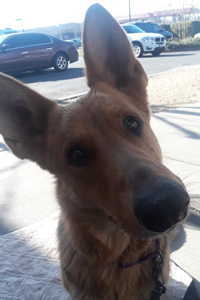 Currently in a foster home with a large female German Shepherd and a smaller dachshund, he gets along great with them. Gregor has medium energy. He loves to travel and be outside with his family. 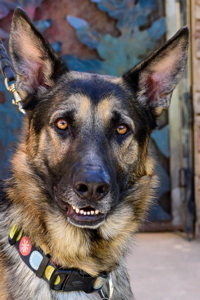 Despite his grand appearance, Jylo is an easy-going boy in the home with his human. He has superb house manners and does well alone for many hours. He is content laying on his bed, or will entertain himself by playing soccer with a ball. He's housebroken and makes liberal use of a dog door, flying in and out when excited. He craves attention, and apparently could only get it previously by jumping on people and mouthing at their hands. Selleck is a handsome 2 year old male who came to us from a local shelter so nothing is known of his background. He is black and tan in color and weighs about 75 lbs. It appears that indoor living is new to Selleck, but he is quickly learning the household routine. He learned to use the doggie door and no longer has accidents in the house. 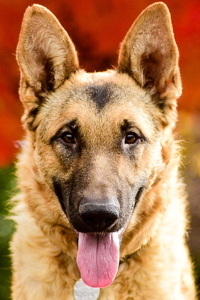 Living with 3 other German Shepherds in his foster home and while he doesn't engage much with the other dogs, he is respectful of them and only occasionally gently corrects the pup if he gets too pushy. Selleck prefers to shadow his human around, making himself comfortable wherever his people are hanging. While this boy is sweet as can be, continued socialization and training will improve his confidence and bring out his full potential. She is house trained and understands the go potty command. She doesn't mind going outside to do her business when it's sprinkling out. She is crate trained and knows some basic commands. She rides nicely in the car, likes to chase tennis balls and play with squeaky toys. It took a while but he loves to go on walks and is a very curious pup. When he has been outside for a period of time or away from his foster family he will try and jump into your laps or on your person. 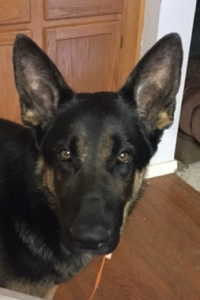 Worf Is a large 88 pound black and tan male, (mostly black). He was surrendered to a local shelter so nothing is known of his past. He is 2 years old and looks very formidable, hence the name Worf. He likes to mournfully howl at sirens, sounding exactly like a large wolf. He is nicely house trained and has medium energy. He is living in a home now with a flexible screen that gives him access to the back yard. He lets you trim his nails, especially when you massage his tummy and give him treats in between clips. 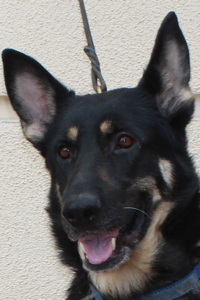 Atnas is a black and tan two-year-old, who weighs approximately 60 pounds. He was surrendered to a local shelter so nothing is known of his past. His name is Santa spelled backwards since he came to us at Christmas time. Pictures can't capture how adorable he is. He gives kisses (without licking), which is quite sweet. He is housebroken, with nice house manners, only occasionally playing with your belongings. He sleeps in his foster's bedroom quietly, not needing a crate. Fletcher is the most affectionate of the puppies. He loves to be held and give puppy kisses. He is also the largest puppy in the litter. He is very active and socializes with all of the other puppies in the litter. He loves to make noise with the squeaky toys. He carries them around proudly all the while making them squeak. 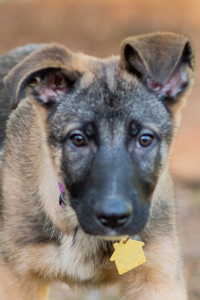 Finley is a 3-month-old, female, sable GSD from the Baseball Hall of Fame litter. Finley is an absolute doll. Sweet, smart and adorable. She has a well-balanced personality. 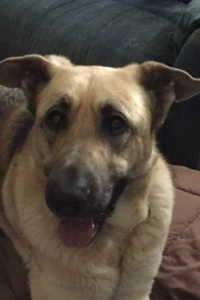 She is confident but not pushy, loves everyone she meets and is doing great with the bossy female and 2 large male GSD's in her foster home. She sleeps well in a crate all night and is quickly learning potty training. 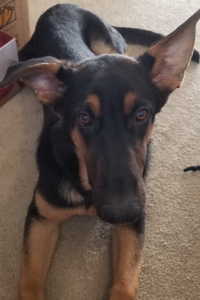 Rudy is a black and tan male, between 2 and 3 years old, who weighs 82 pounds. He and a companion dog were surrendered to a local shelter, but nothing else was provided about his background. He does well with other dogs. As he has recovered from a bout of kennel cough, his personality is that of an affectionate adolescent, head strong family member. With consistent training, he will be a fantastic addition to a family. He knows basic commands (sit, down, come, out of the kitchen). He also is house-broken and crate-trained. He needs chew toys, yet hasn't figured out how to fetch yet. Klaus is a strikingly handsome, black and tan long-coat who came to us from a local shelter, and nothing is known of his background. He is approximately 14 months old and weighs just under 75 lbs. Klaus is housebroken with use of a doggie door and he is learning house manners. 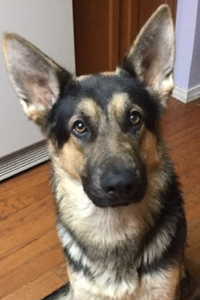 He is living in a foster home with a 3yr old female German Shepherd and two middle aged male German Shepherds and gets along well with all of them, and he especially likes to engage in play with the young female. He has ignored the cat in the foster home, so he might be OK with other dog savvy cats as well. Small critters and small dogs are unknown. Hans is a handsome 2 year old, 80 lb, black and red male that came as a stray from a local shelter, so his background is a mystery. Hans is very affectionate and loves head rubs, belly rubs, back rubs- you name it! He has moderate energy and behaves quite maturely for his young age (although occasionally he can't contain his excitement and he jumps up). His goofy, puppy side comes out when you break out the toys! 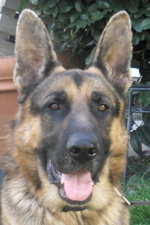 He lives with 3 other Shepherds in his foster home--a young male, young female and middle aged male. He gets along with and has has accepted the older male and female as pack mates and just started showing interest in playing with the female. He can get competitive with the young male and occasionally needs to be reminded not to push boundaries with the resident dog, but learned to tolerate him. Lara A. is a real sweetheart who gets along well with other dogs, loves all the people she has met, and will make a wonderful addition to a family that will make her an active member. 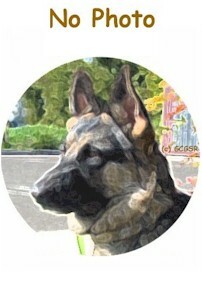 Now 4 years old, this black-and-tan girl weighs about 70 lb. She was an owner surrender to a local shelter, so little is know of her background. 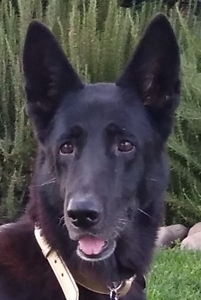 Since her rescue, Lara has received some basic training and has really blossomed. 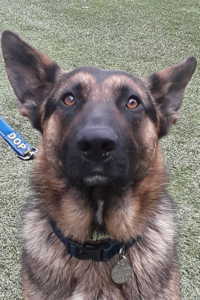 Shep is a very handsome, 55 pound, three year old black and tan male. Shep was a stray from a local shelter, who arrived there with a major injury to his front leg and a dislocated rear hip, likely from being hit by a car. His front leg was amputated before he was transferred to us. Shep has undergone another major surgery on his hip and has been receptive to all medical treatments and attention he has received. Shep is currently recovering from his hip surgery and will need additional, slow walks until he is fully recovered. Due to his need for recovery, small children are not recommended. 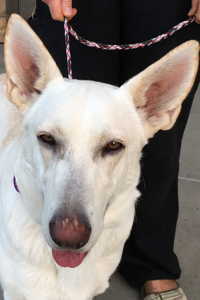 Emily is a cute, smaller female GSD with a thick white coat with creamy tan tones down her back. She came to us as an unclaimed stray from a local shelter, so nothing is known of her background. Her shorter legs and broad nose give her a stubby, but adorable stature. The vet at the shelter estimates her age at between 2 - 3 years. 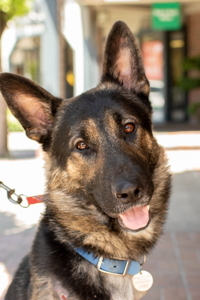 At just over 50#, Emily is the perfect size for someone looking for a more compact GSD. She appears housebroken, and has not had any accidents since she has been with her foster home. Although she is on the smaller size, Emily holds her own with the larger dogs she has been living with in her current foster home. She loves to run around outside and play chase with her foster pack, just as much as she loves to hang out with them in the house. She is still learning proper leash manners, but she really enjoys going out on neighborhood walks with her pack. She also rides well in the car. Foxy is an approximate 6 year old, black and tan petite female weighing about 50 lbs, but can stand to put on some weight. She came to a local shelter as a stray, so her previous life remains a mystery. 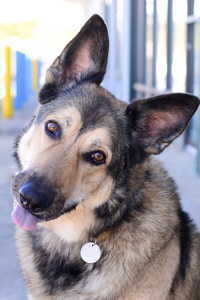 She is a reserved and affectionate girl with low to medium energy. 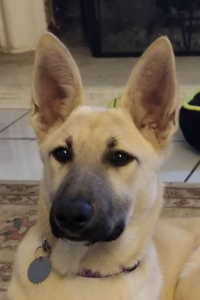 Currently, Foxy lives in a foster home with a young, active male (See Sonny, available Males for adoption) with whom she gets along well, although she has yet to understand his need to "fetch the ball" or seek play. Foxy prefers a calm environment, thus, she will do best in a home without small children. Merida is a pretty, young red and black female approximately 2 years old. She came to us from a local shelter, so little is known of her background aside from the fact that she recently had a litter of puppies. The shelter has placed her pups in homes and now it's her turn to find her forever home. Merida is on the petite side at about 65 lbs, but still needs to put on some weight. This sweet girl is quickly adapting to all of the new experiences that living indoors has to offer. 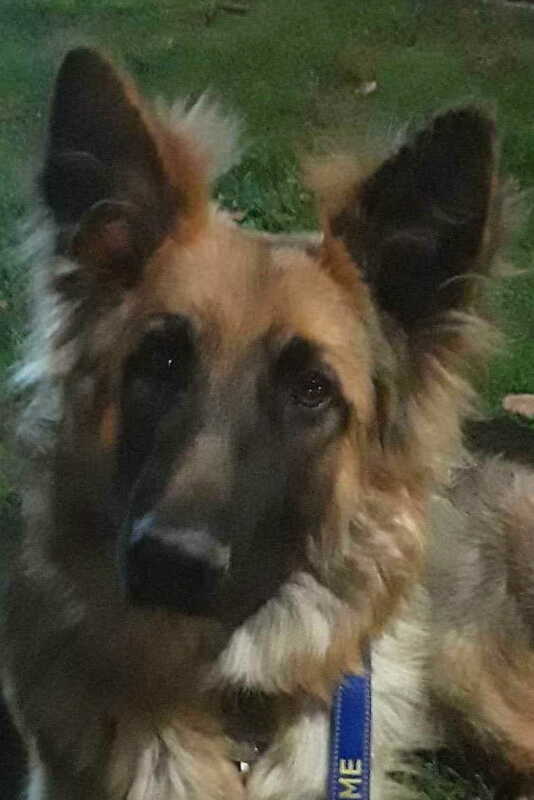 She is living with 3 other German Shepherds in her foster home. Initially, she seemed intimidated by the other dogs. 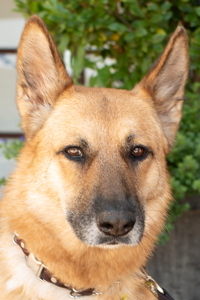 Evita is a cute, funny and charming mature lady around 5-6 years old and average-sized at around 65 pounds. She was a stray in a local shelter, so her background is unknown, but she came to us with decent house manners and takes direction well with a good understanding of most basic obedience. She's very food-driven, and will try to stay as close to the kitchen as allowed, but understands when told to get out of the kitchen. She will sit (after spinning in circles a couple of times first) and wait for her meals, will speak on command, and understands coming in and going outside, and has decided that having a dog-door is the coolest thing in the world. Once she discovered she could go in and out as she pleased, she spent a whole day doing just that. 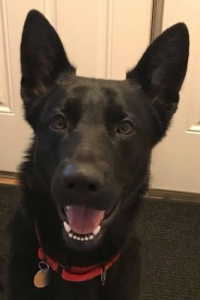 This feisty girl is very well-socialized to people and dogs, and lives quite comfortably with two mature male German Shepherds, although she tends to be very bossy and would really rather have all the attention and toys for herself. 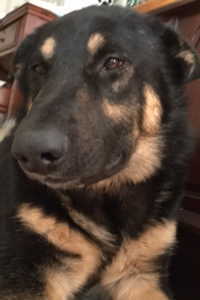 Redford is a black and tan, male GSD approximately 1-2 years old. His fur is soft and very wavy. He weighs about 55 pounds and could stand to put on a little weight. He was a stray at the local area shelter so nothing is known of his history. Redford is an absolute sweetheart. Very affectionate and easy going. 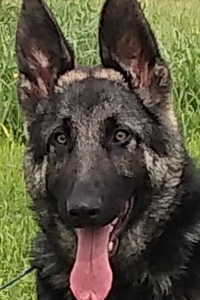 He is currently living with 2 large male GSD's and a female GSD and has fit in very well. Still a youngster, he has a lot of energy but corrects very easily. He appears to have some vision impairment and will be seen by an animal ophthalmologist to correctly diagnose his condition. Redford has no clue his vision is impaired and from his perspective, it doesn't affect him whatsoever. Looking for a dog that was adopted last month or last year? We now have a page for our dogs that were adopted during each of our years (2011, 2012, 2013, 2014, 2015, 2016, 2017 & 2018)! Happy Tails (Adopted Dogs) of 2018! Happy Tails (Adopted Dogs) of 2017! Happy Tails (Adopted Dogs) of 2016! Happy Tails (Adopted Dogs) of 2015! Happy Tails (Adopted Dogs) of 2014! Happy Tails (Adopted Dogs) of 2013! Happy Tails (Adopted Dogs) of 2012! Happy Tails (Adopted Dogs) of 2011!